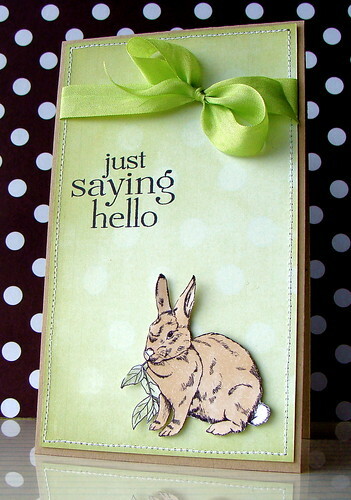 Lucy's Cards: JustRite Blog Hop Mystery Blog Candy WINNER and a sweet bunny! JustRite Blog Hop Mystery Blog Candy WINNER and a sweet bunny! What a nice job you did!! I don't think I could ever cut so neatly. CONGRATULATIONS Connie. Please email me to claim your prize. And... it's release day at Squigglefly which means Jane has some new gorgeous digi stamps available to buy. First, this Vintage Rabbit. I combined him with some yummy digi paper from Shimelle Lane's new digikit Springtime Basics - I can see me using this kit a lot. I just love the soft polka dots in this paper. The sentiment is from THIS cute Hero Arts set. And then there are these beautiful tulips. Love them. Again the paper is from Shimelle's kit, a soft grid paper. The sentiment is from Papertrey Ink's Mega Mixed Messages set. Jane - I LOVE them both. Perfect for Copic colouring. and this week's guest designer Jill. And finally, if you haven't yet, check out the other JustRite winners for Day 2 here, here, here and here. :) Thank you ALL for such lovely, heart-warming comments. I have adored reading them all. Oh, these cards are lovely! What a beautifully clean and fresh look they both have!!! Sweet bunny, love the ribbon on that one. Very pretty tulips, love the color of the background. 2 weeks off, wow. Enjoy them. Beautiful cards!!! Love the colors! Love your Jane cards! The bunny is adorable and the tulips are coloured so perfectly! Congrats to Connie! Have fun shopping! LOVE LOVE them both!!! And you can tie a mean bow my friend!! Just beautiful Lucy. love those tulips and the colouring on the bunny is just perfect. your bunny is soooooo cute! i love the soft color you colored him with! 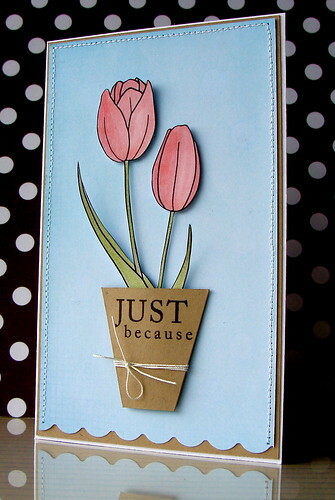 love that you put those pretty tulips in a pot, too! so fun! Lucy, I love the colors you used in these cards! Simply beautiful! TFS! Cute cards - both of them very elegant! So cute and pretty! Love how you used Jane's pretty images! Love the bunny holding the leaf stem! Both cards are gorgeous! Lucy, FAB cards - love them all. Enjoy the holidays.. can't wait to see what you create.